Capturing and sharing lectures online is quickly becoming the future of higher education. Not only allowing students to get more out of the learning experience but also enabling universities and high schools to reach larger audiences, even if they can’t attend in person. 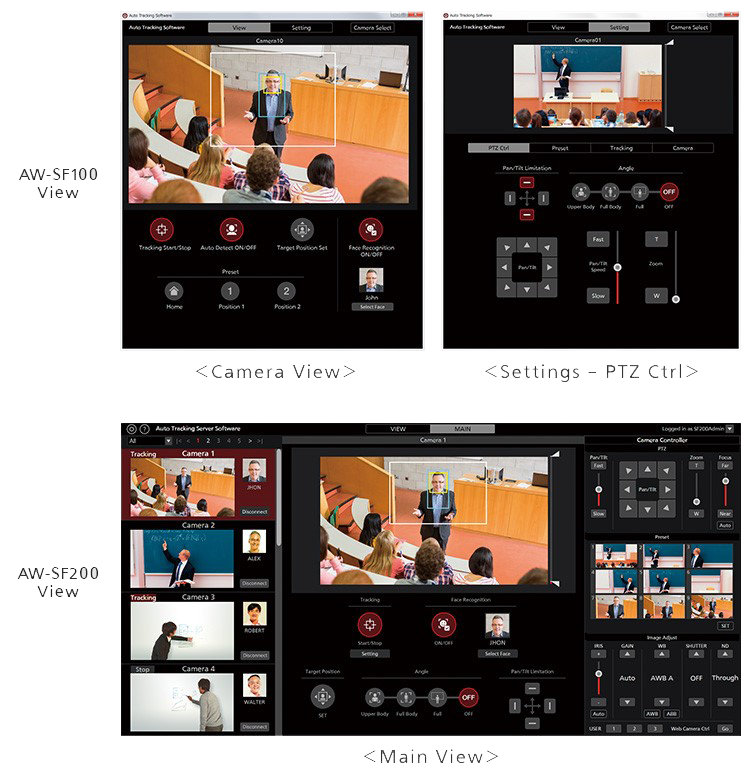 Lecture Capture is a suit of technology that allows institutions to record classroom or lecture hall presentations and post digital versions online available for either live streaming or download. 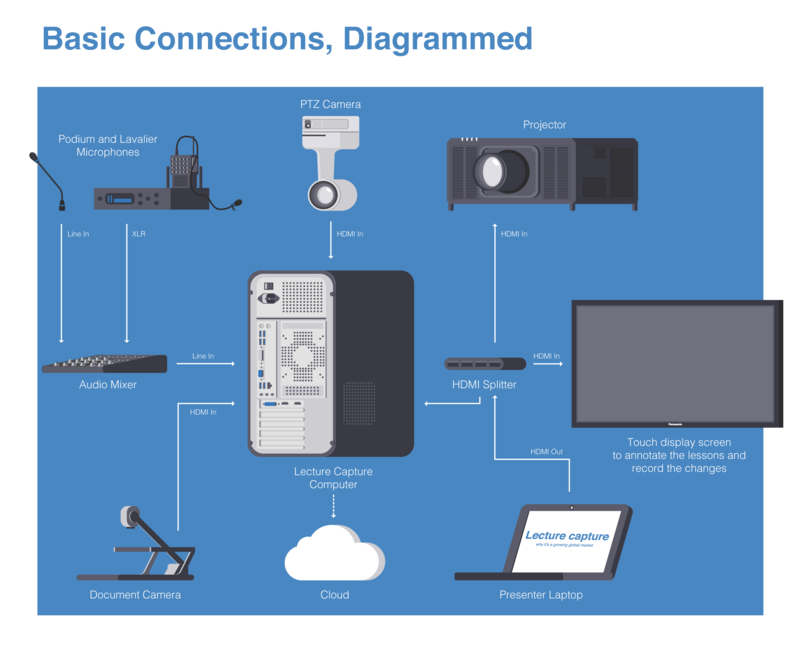 Panasonic Lecture capture over IP is a cable-free and integrated solution which includes video capture, 4K projection, interactive whiteboard and online publishing (through external software such as Panopto). 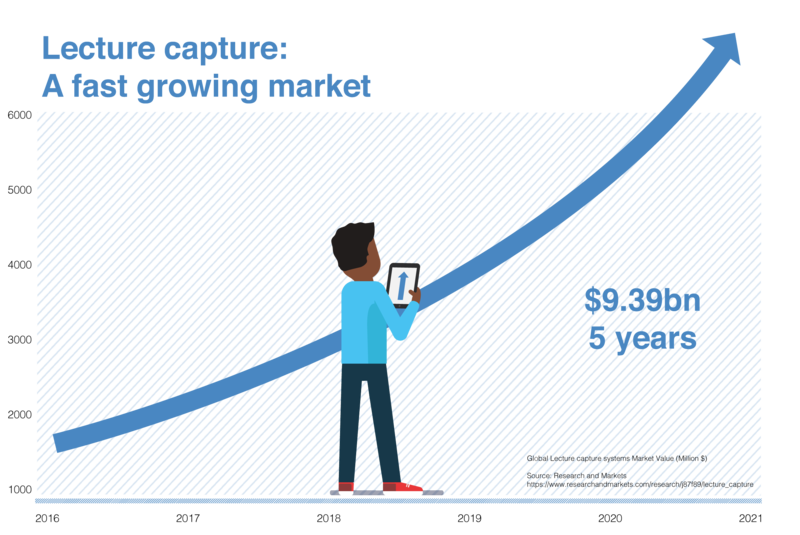 Recent market research suggests the global lecture capture market could increase from $2.24 bn in 2017 to 9.39bn by 2022. 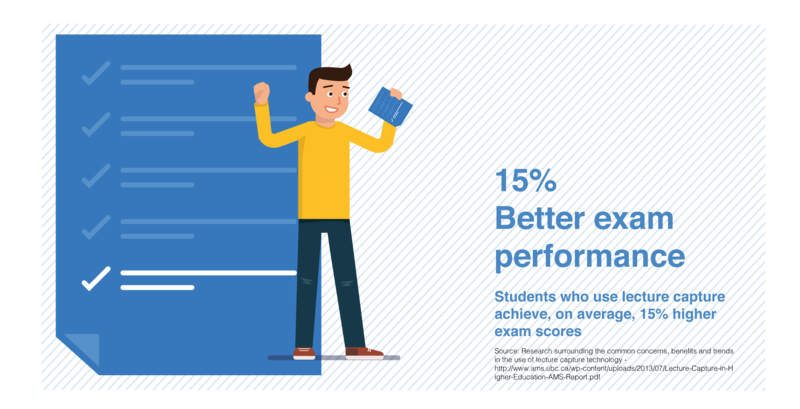 Panasonic also conducted a survey interviewing 171 universities and other higher education institutions across 14 countries and found out that nearly 60% have planned to invest in Lecture Capture over the 3 coming years. Read the white paper about potential growth of Lecture Capture technology in Higher Education in Europe here. The survey conducted by Panasonic Business in association with AV technology explains about the drivers and market trends in Lecture Capture. What could be the barriers or fears? 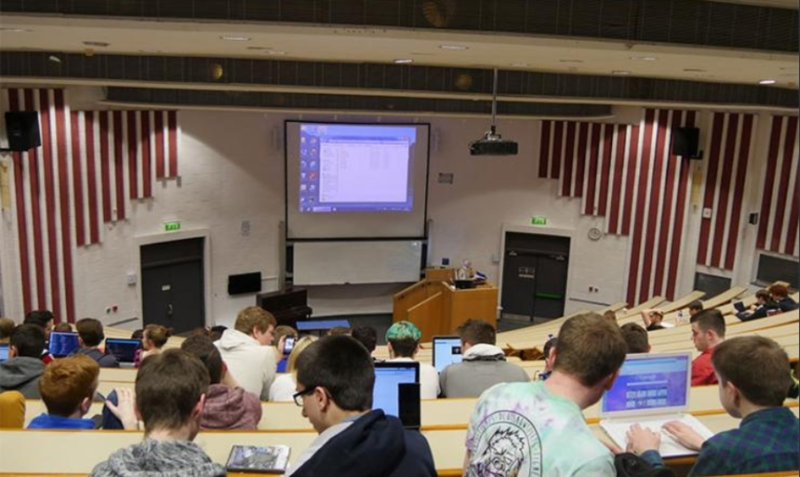 Reassuringly, some lecturers’ fears of a drop in physical attendance are proving unfounded. 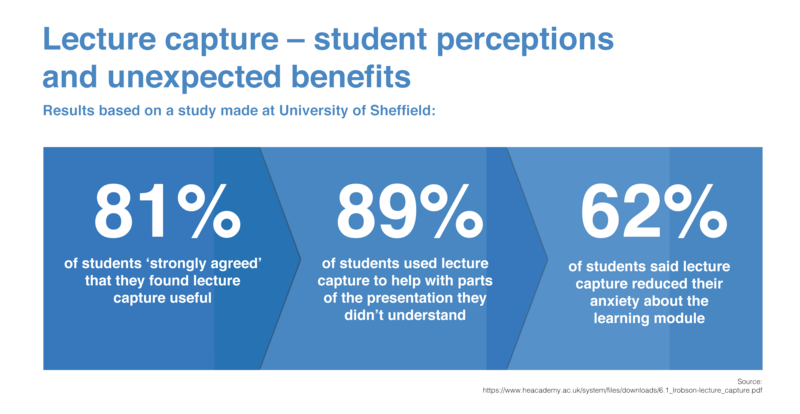 A University of Aberdeen report* published earlier this year found no evidence that lecture capture reduces attendance. Lecture capture helps make complex and difficult subject matter easier to understand. Lecture capture is great when the content isn’t in your first language, or if you find note taking difficult. If students can’t ask all the questions they’d like during a lecture, or couldn’t attend, then they can view it later and ask follow-up questions. Lecture capture is perfect for distance learning and overseas students. It’s a great way to fit in with students’ different learning styles and preferences. It especially helps students with disabilities or long-term illnesses who cannot attend lessons in person. Lecturers can review and refine their content before going live. And they can easily add information from other sources to their lecture presentations, making them more memorable. Create more engaging, interactive lectures. Make better use of classroom time, and encourage students to review ideas and problems outside the classroom. Identify what parts of lectures receive the most views, and what elements need more clarification or emphasis. Increase student enrolment numbers by adding people who can’t attend lessons. Review lectures, identify areas for improvement, and help lecturers with their professional development. Avoid having to continually repeat information especially in front of large audiences. Make sure colleagues have quick and easy access to each other’s lectures. 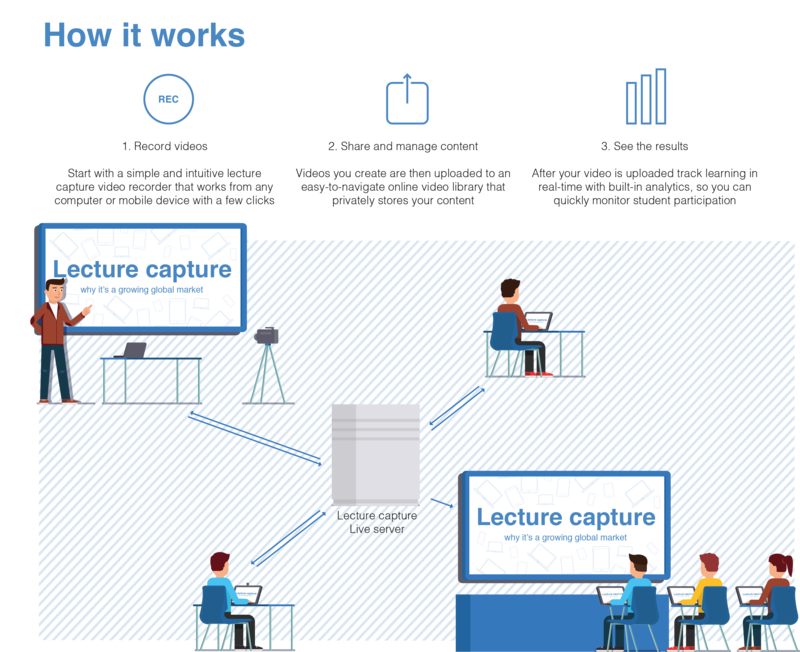 Lecture capture systems include software and hardware to match institutions’ needs. As a minimum, they require a camera and lecture capture software allowing students to review the courses. To which you will then usually add projection and displays screens. Panasonic Lecture Capture is fully integrated over IP, giving you the freedom to record, share and play 4K video without cables. 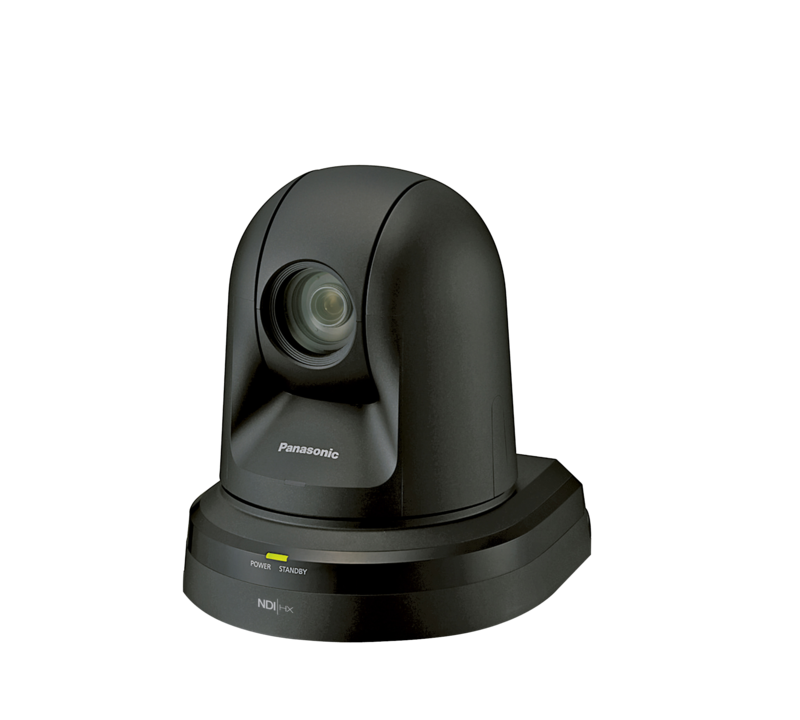 With an incredibly wide range of capture options, Panasonic is consistently chosen for capture quality and zoom range as well as build design and free software. Panasonic new cameras (HN32, HN40 and HN130) are now a source for all NDI compatible systems and software on your network. 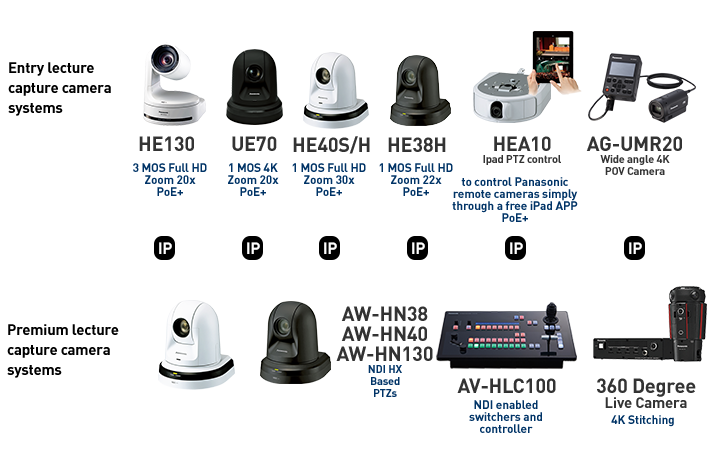 With NewTek NDI | HX driver enabled, all cameras detected on your network are immediately available for use - with no complex configuration required. NewTek provide free software tools which can be downloaded here including Studio Monitor and Virtual Camera to use NDI|HX within Lecture Capture systems such as Panopto. In addition to the hardware, Panasonic is completing the offer with free software especially designed for lecture capture usage. Our easy-to-install auto tracking software uses facial recognition that allows the camera to follow the speaker during the lecture, so you don’t need a separate camera operator. Additionally, you keep students’ engagement at the highest avoiding large wide angle views not focused on the teacher. Virtual USB is a free downloadable software for Windows. The software converts the RTSP stream from Panasonic PTZ’s into a WDM (Windows Driver Model) format. This means video & audio is now converted into a readable format for windows-based applications with customisable frame rates and resolutions over a single CATV cable. Up to 4 streams can be used at one time. Our projectors are perfect for classrooms and auditoriums. They ensure the visualisation of images, data and video at the highest quality from 3 000 to 30 000 lumens. Plus, with the latest laser technologies they offer the highest reliability and lowest maintenance. Read about how laser projection technology benefits to the Education market compared with lamp-based projectors. Among other findings, laser technology brings brighter better projection (cumulated light output 22% greater) and a lower lifetime cost of ownership (more than 11% lower). Use our professional displays to deliver your messages anywhere and interact more effectively with your audience. Our displays have crystal clear images with unrivalled brightness and clarity, from standard flat screens to video walls or touch displays in FHD or 4K resolution. Link our cables to Panopto. No cables. No hassle. With our software partner Panopto, we make it easy for you to integrate our cameras to your system without the need of cables. Panopto makes it easy to scale up your use of video – even if you’re looking at a campus-wide deployment. Panopto offers the flexibility to record any combination of video sources, in any configuration, in classrooms of any size. 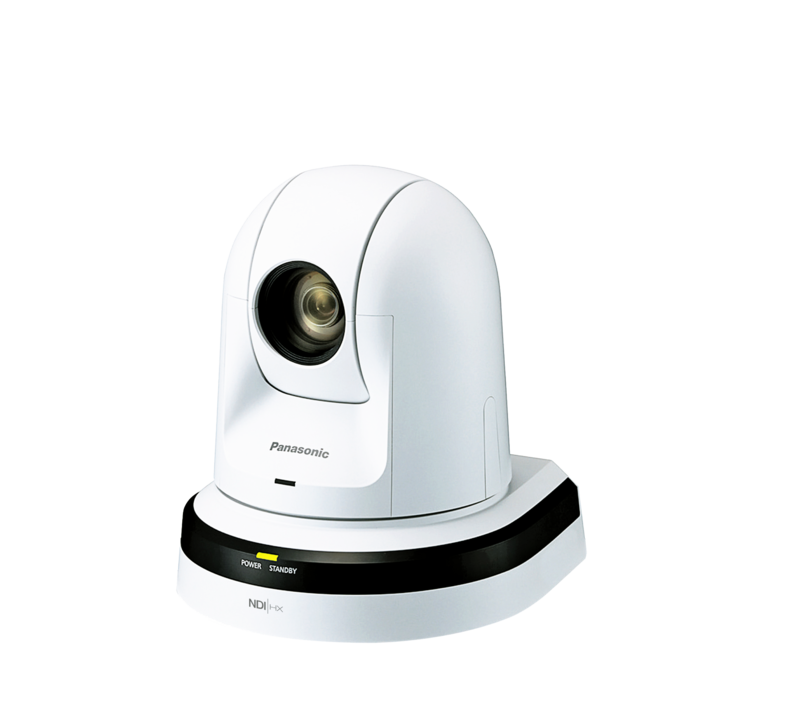 Panopto automatically recognizes any connected cameras and microphones, and remembers professors’ recording settings to make setup simple. We offer the ability for administrators to schedule recordings ahead of time with automated recording options. This means lectures are captured in full without lecturers having to do anything other than present their content as normal. Granular sharing permissions and integrations with all of the most commonly used Learning Management Systems mean your institution can make sure the right content is being shared with the right students when they most need it. Panopto makes it easy to securely live-stream lectures with just one click, increasing access to popular lectures and helping you connect with external audiences. With Panopto, you can add multiple choice, checkbox, and true/false questions to videos in order to test students’ comprehension, reinforce key concepts and improve knowledge retention. This creates a more active learning experience for your learners. Panopto’s powerful video search functionality – Smart Search – allows students to search for a keyword and be taken to the specific moment in a lecture where that keyword is mentioned. Panopto automatically indexes every word spoken, shown on-screen or featured on a slide deck, so students can find and fast-forward to the exact moment in videos where their search term is used. Panasonic Solutions have proven their worth for customers right across Europe. 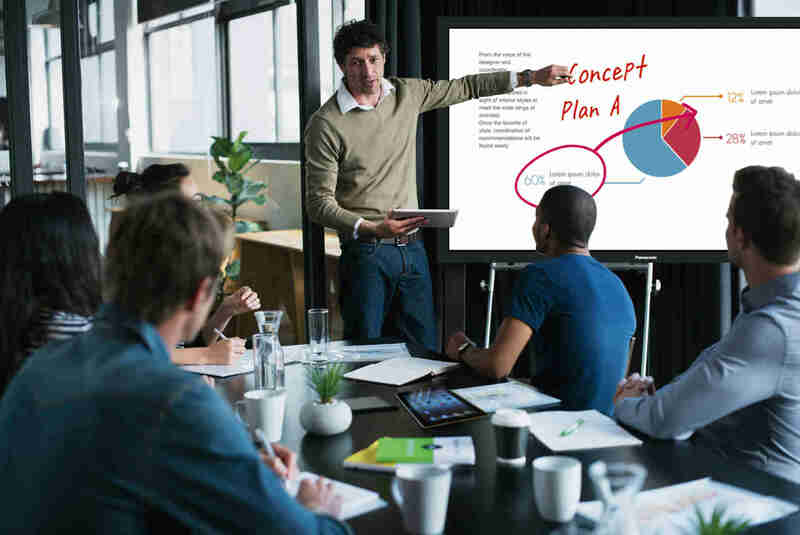 Our low cost of ownership projectors and professional displays are the silent workhorses in the background giving organisations in Education the freedom to collaborate. Take a look through our library of downloadable case studies, to discover exactly how our technology is setting the working world free to succeed. Alternatively, if you wish to receive Panasonic information related to our products or to the Education market please click on our subscription centre.